This is a perfect jumping-on place for those who have missed out so far (and if you have missed out…wow, you have really been missing out on a great series). We see the aftermath of the crossover with the Teen Titans and Deathstroke, and set the stage for a very big event for our favorite heroes. There’s danger, romance, broken hearts, lost memories, and more in this issue. Don’t miss this one, as it sets the table for the future of the TITANS. Want to know more? Follow us after the jump! 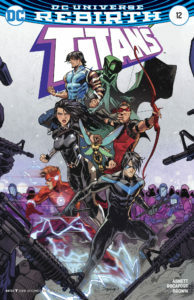 This entry was posted in Reviews and tagged Bumblebee, Donna Troy, Mal, Nightwing, Omen, Psimon, Review, Titans, Wally West on June 15, 2017 by Ed Garrett. 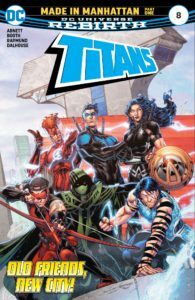 After a terrific first arc that we called “Wally and the Titans”, we begin to explore more of this classic Titans team from the new perspective of the REBIRTH era. Herald and Bumblebee are looking for help with their powers…but have they chosen wisely, or are they in the very last place they should be? Want to know more? Follow us after the jump! This entry was posted in Reviews and tagged Bumblebee, Fearsome Five, Herald, Mal, Review, Titans, Wally West on February 9, 2017 by Ed Garrett.